If you’re considering getting a graduate degree, chances are you’ve considered paying for at least some of it with student loans. Have you asked yourself using loans is wise? The first step to answering the question is examining whether you really need a graduate degree at all. If you don’t require the graduate degree for your career, then you’d be going into debt for a want. You’d be hard-pressed to find a financial expert who would advise that. What Does Your Career Say? When you first set out in your career field after attaining your Bachelor’s degree, you might have known that a Master’s degree was definitely in the cards. For fields like psychology and social work, you’ll earn more and have better career opportunities if you have a Master’s degree. For example, the average starting salary for a graduate with a Bachelor’s degree in psychology was $37,000 in 2013. With a Master’s degree, the average starting salary was $48,200. Almost all fields will pay more for a candidate with a Master’s degree, but the degree might not always be worth it for a few reasons. First, having a Master’s degree might actually keep you out of consideration for certain jobs. If you’re getting a Master’s degree immediately after your Bachelor’s, you’ll be applying for entry-level positions. Some employers might not consider you, thinking you’re overqualified. Having the Master’s can increase your asking salary, but it might decrease the number of positions that will give you a legitimate shot. On the other hand, if you’re in the middle of your career, getting a Master’s degree in certain fields (like business and engineering) can increase the number of positions you qualify for – not to mention an increase in pay. How Will You Pay? Do Loans Make Sense? 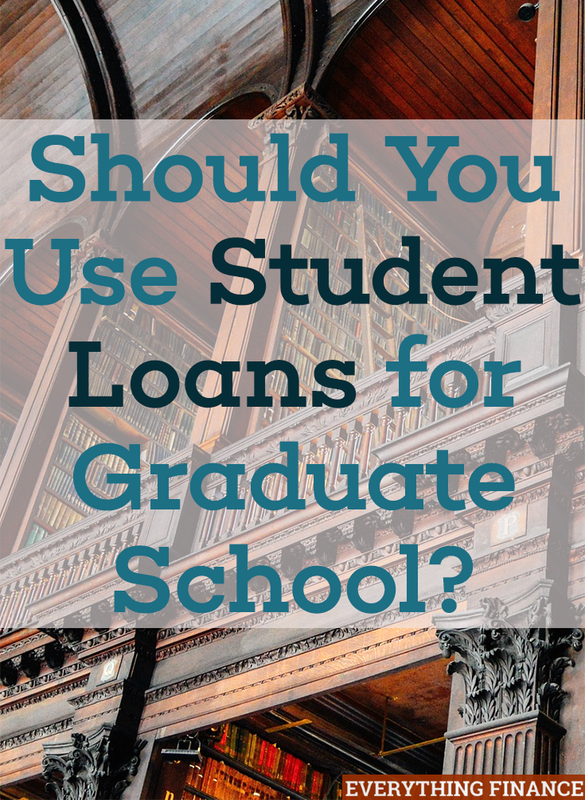 If you’ve decided a graduate degree is a must for your career, then the next step is deciding whether or not funding your education with student loans makes sense. Do some salary research to find out what pay you can reasonably expect to make with your Master’s degree. Sites like Payscale and Salary will let you research salaries by field and area. Armed with your location and experience, you can make an educated guess on what salary increase you can expect with a graduate degree. You might be able to google your field and find additional information. For example, I have an aerospace engineering bachelor’s degree. After a Google search, I learned that the average starting salary for aerospace engineers with a Bachelor’s degree is $53,408 per year, compared to $62,549 with a Master’s, and $73,814 with a doctorate. These numbers seem roughly accurate to me (assuming you’re an entry-level candidate). That means the average aerospace engineer can expect a $10,000 per year bump in salary for getting a Master’s degree. For an in-state resident at a public university, tuition and fees might run around $5,000 per semester. For out-of-state residents or private universities, the cost might be closer to $10,000. After four full-time graduate semesters, an in-state resident at a public university could have $20,000 in student loans, compared to $40,000 for an out-of-state student or private university education. Keeping that in mind, you can reference a number of online calculators to get a feel for what your monthly student loan payments might look like. You can play with types of loans, interest rates, and repayment terms. Let’s just say for this example, the aerospace engineer learns their repayment will be $405 per month for 10 years. We’ve already learned they might only see a $10,000 per year raise, and around 70% of that will be eaten up by taxes and retirement contributions. That leaves them with a monthly salary increase of about $575. For this particular aerospace engineer, we’re seeing that their degree will only net them about $170 per month – at least initially. The Master’s degree might make them eligible for more lucrative promotions. Eventually the student loans will also be paid off, allowing the student to pocket all the additional income. However, for some degree fields, the research might show that the student will actually go negative. If the increased salary is only $5,000 per year and the Master’s program is very expensive, the student will end up with less money in their bank account each month than if they hadn’t gone to school for a Master’s degree at all. If you’ve decided you really do need a Master’s degree, but you’ve discovered student loans aren’t a very good deal for your particular situation, alternatives are available. For the most part, the alternatives aren’t that different than the alternatives you had as an undergraduate. There is no law you have to be a full-time graduate student. If you’re working full-time, but attending one class a semester at night, you can save up your tuition and pay as you go. If you aren’t able to save up the money, you should question whether you’d ever have the money to pay your loans. After all, what if you don’t get a better job or raise at your current position? Scholarships and grants are also available for graduate-level degrees. This is where google will be your friend again. Spend time researching scholarships and grants for your degree field, but also check into opportunities that are available to certain demographics – not all scholarships or grants are tied to specific fields. For example, if you’re a single mother, you could look into scholarships and grants specifically available to single mothers. You won’t be eligible for all of them, so don’t get discouraged if you don’t meet the requirements for the first few. Keep looking. Eventually, you might find something that’s a perfect fit for you. Your future graduate school will also be able to help you find scholarships, but their assistance doesn’t end there. Contact your graduate school of choice and find out what financial assistance they offer graduate students in your degree field – and be honest about which options work best for you. Some schools offer fellowships, which are merit-based awards that don’t have to be paid back. Generally speaking, these are available for full-time students only. Having a financial award that you don’t have to pay back sounds attractive – unless you have a high-paying salary that you can’t leave because of other obligations, such as having a family to support. Almost all graduate programs have research and teacher assistant positions. Depending on the school and your availability, these positions might pay some or all of your tuition. Again, these might not be good options if you have a demanding full-time job. If you are a full-time employee, your current job might pay for your graduate degree – or at least some of it. Many employers recognize they benefit from a more educated workforce, so they offer a tuition reimbursement option. On top of the reimbursement, you might be eligible for taking classes on “company” time, without having to make up the time at work. This is a great option if you have a family! Throughout my professional career, I’ve seen tuition reimbursement packages that vary quite a bit. Some employers will require you to pay for the classes up front, but they’ll reimburse you after the semester is over if you provide proof of a satisfactory grade (usually a B or higher). Others have relationships set up with local institutions and they pay your tuition up front. The policies I’ve seen usually require the degree to be applicable to the employee’s position, or a position they could reasonably be expected to hold. Back to the aerospace engineering example – a design engineer probably wouldn’t be reimbursed for a Master’s degree in psychology. The company wouldn’t have any use for that education. The caveat to this option is most employers will have a policy that states you have to pay back the tuition if you leave the company within a certain amount of time, usually 1-2 years. If you know you’ll need to leave your employer to put your graduate degree to use, then you’ll want to make sure you understand any rules like this. If your current employer doesn’t offer any tuition reimbursement, you could find a job with an employer that does. This benefit is a strong selling point for many companies, so they often list it on their human resources pages along with a general overview of their benefits. As you consider this option, you should also think about whether or not it makes sense to take a small pay cut in order to get your Master’s degree fully-funded. As with most choices in life, you don’t have to approach this as an all-or-nothing. If you can get a small scholarship and some reimbursement from your employer, but you still need some extra money, then it might make sense to use some student loans for graduate school. Be smart about continuing your education. Do your research – is a graduate degree really worth it for you? If so, don’t rush headlong toward loans just because they seem like an easy option. You can save yourself money and stress by considering other paths. Is a graduate degree a good idea for your career? Why or why not? If you have a graduate degree, how did you pay for it? For some degrees, you need to get a Master’s or you can’t get a job in the field. Research is the key in this area. If you are able to get by without a Master’s Degree right away, getting some experience in the field, and making sure you actually like the field of work, is smart before spending the money for the Master’s. However, sometimes you just need to jump in right away if the career path you choose doesn’t work well without the higher degree. I think I can pay for graduate school myself if ever I enroll myself in. Getting a student loan for graduate studies is not worth it and advisable in this period of education. There are many ways to avoid myself from having student loan such as getting a scholarship. I have friends who got their PhD or MA degrees without getting a student loan.